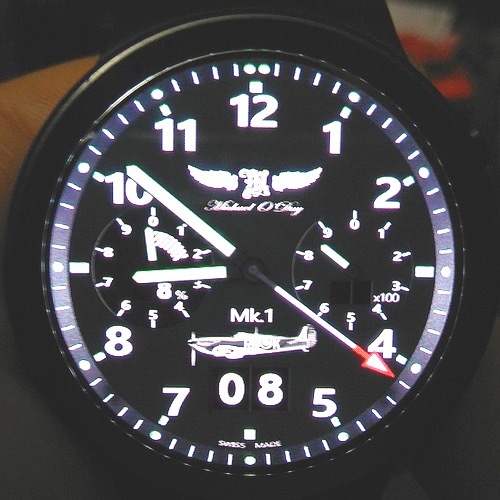 @dfrangu has reported an error with my Aviator Mk.1 watch face. When the date is the 28th, my watch, a Samsung Galaxy Watch, correctly displays "2"
On his watch, it displays "0"
Does anyone have any idea why that might be? Has anyone else had a problem with this watch face? Displays nothing ( ie. blank ) when battery level was 98%; on my watch it would display "9"
Displays nothing ( ie. blank ) when steps was 8537; on my watch it would display "8"
The steps and battery hands work correctly on his watch so the flags must be returning the correct values. So, it looks like a problem with the floor function behaving differently on differnt watches but I cannot test this. Any ideas anyone? What kind of watch does he have? And yeah, the floor function seems to be the first thing I'd narrow it down to. Thanks for the reply. I don't know his watch model. He did send a photo but I am not familiar with the different smart watches. Do you recognise it? Do you see anything wrong in my expressions? I am not using them in some strange way am I? You are missing the '0' after the ':' here. Not sure if this was a typo. I assume this should be '0'? I have made some tweaks. Less is more, and be disciplined with syntax .. Thanks for that. I'll make the further tweaks. Have you come across certain watches producing different results with the expression floor ( #Dd# / 10) or similar? But overly complicated syntax does not work the same on Creator as it does on watches (and varies between them).